This is another example of an Edison studios location shoot, this time in Harrisburg, Pennsylvania. The movie emphasizes movement and contrast, as much as its location, to capture the attention of audiences. We see a busy street with light snow cover. 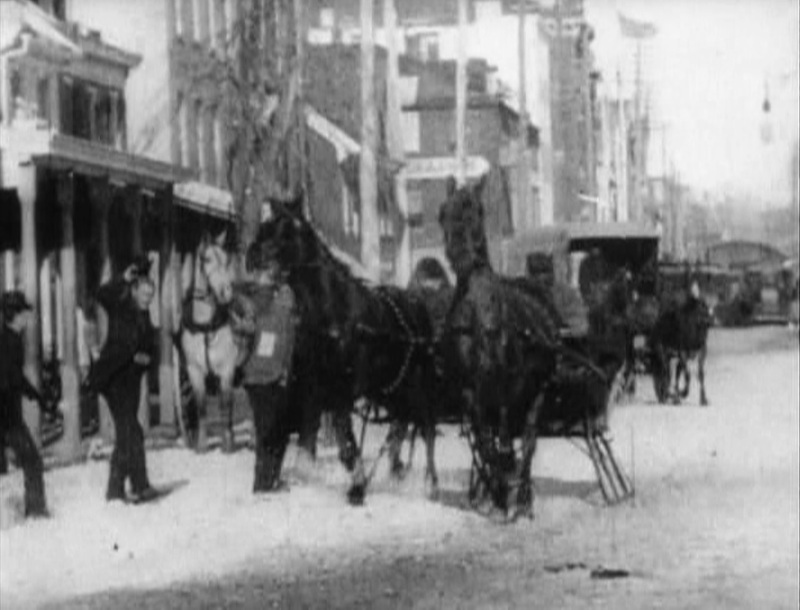 A series of horse-drawn vehicles rush across the screen, past a small crowd of gathered onlookers. The second of these is the “sleigh” mentioned in the title, while the other two have wheels. As the sleigh goes by, one of the bystanders waves his hat in encouragement, as if observing a race. In the background you can see a trolley sitting in the street – no horses in evidence, possibly it is electric. This short film was made while the Edison company was in town to shoot exclusive footage for the Bijou Theater which was exhibiting the “projectoscope” – an advance over the kinetoscope that allowed the projection of movies onto a screen. Charles Musser cites a catalog entry which states it was taken “after the first fall of snow and shows an exciting race along the river road.” The Library of Congress gives a different catalog entry that says “This subject taken just after the recent first fall of snow, shows two enthusiastic horsemen indulging in a ‘brush’. with their respective horses and cutters.” Both descriptions suggest a competitive race, as suggested by the onlooker waving his hat, but to me it just looks like three vehicles driving normally down the street. Perhaps my view is spoiled by years of modern car chases and other high-speed spectacles.